As part of a commission for the Friends of the High Line in New York, Fellow Kim Beck created a series of fleeting messages from billboards and signage written by a skywriting plane. When in Virginia Woolf’s Mrs. Dalloway a crowd gathers to read letters in the sky, the spectacle unites disparate groups, as they cluster together to find meaning in the urban landscape. 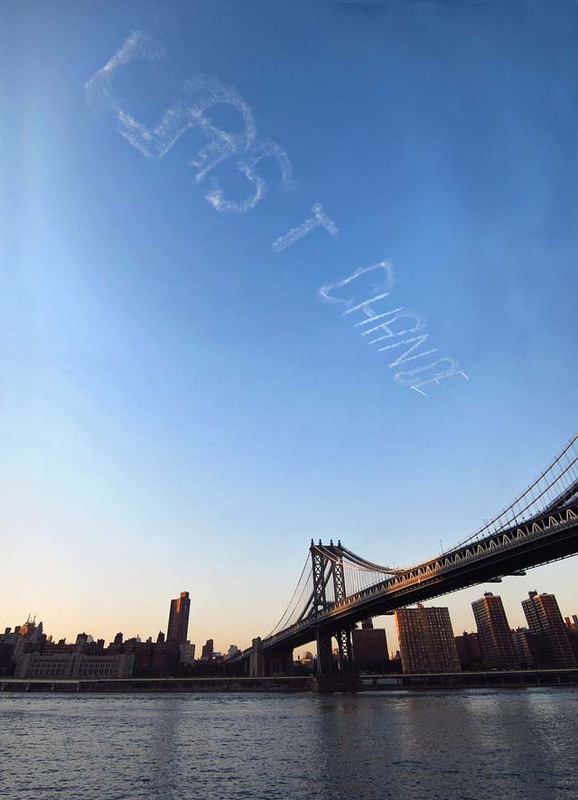 As phrases unfolded above New York City, people looked up to spell out the words. Where some found mere advertising, others considered the implications of messages detached from their original contexts. In the midst of an economic recession, the skywriting caused people to look up at the sky, the most potent symbol of longing and hope. Skywritten phrases included “LOST OUR LEASE”, “LAST CHANCE”, and “NOW OPEN”.